One of the many great things I love about this series is that you can pick up any book, even if it's out of order, and not feel like you're missing a huge chunk of the story. Yes, there are reoccurring characters, but each individual book is centered around a face that's to be discovered. This face happens to be the one of Josh Kowalski, the youngest of the Northern Star lodge clan. Josh has been responsible for the Northern Star lodge while his siblings have gone off to live their own lives. He's always felt a bit of resentment for it since the lodge has been in his family for years and he's felt responsible to keep it there, yet he's also had a strong desire to leave and live his own life, too. Once his siblings realized the position Josh put himself in, they decided it was time to either sell the place, or find management for it - so that it would free up Josh to go do the things he's always wanted to. Only problem is, he hasn't got a clue what those things could be. Meanwhile, his long time best friend Katie has been secretly adoring him for years and years. Though she's always come across as just one of the guys, she's secretly been hoping Josh would see her as more than just a friend - perhaps a girl he could fall in love with, too. As the story unfolds, so does Josh's chances of finally getting out from under the family lodge. But the decision to leave becomes difficult when he finally sees Katie as the beautiful, irresistible woman that she is, and his feelings of friendship begin to shift into something more romantic and meaningful. I really liked Josh's personality in this story. He had me laughing a few times, but just as quickly I'd be swooning for him, too. The friendship between him and Katie felt very believable and the connection they sparked as more than just friends had a fiery passion with a lot of substance behind it. The Kowalski family dynamic is another reason why I love to read this series so much. There are glimpses of past characters I've read about, and others I have yet to read, only leaving me intrigued to find out more. 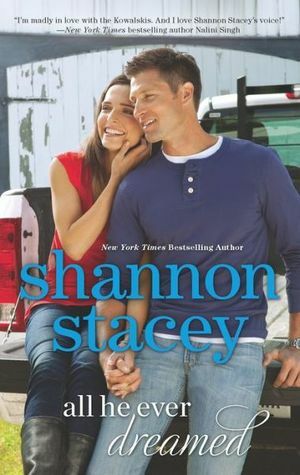 Shannon Stacey has left a mark as a favorite adult contemporary romance writer. I highly recommend her novels to those who are looking for a story to entertain your thoughts and leave you feeling very satisfied. I think I definitely need to read this series. It sounds a bit Lucky Harbor-esque but with its own spin. Yay for great adult contemps!! I think I have this entire series on my Kindle but have yet to pick it up. WHY?? I love the covers and have heard nothing but great things about it. I like that you mention that you can pretty much start anywhere (although I am kind of weird about starting in order and going that way). Thanks, G.
This one sounds great, and I love that you can pick up any in the series without having to read the ones prior. Thanks for the great rec, G!